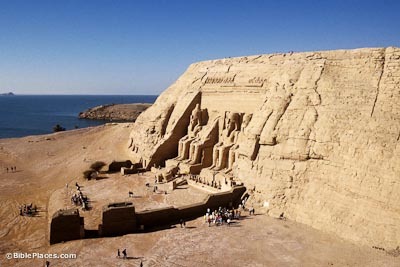 Abu Simbel is the location of the most famous temple of Ramses II. 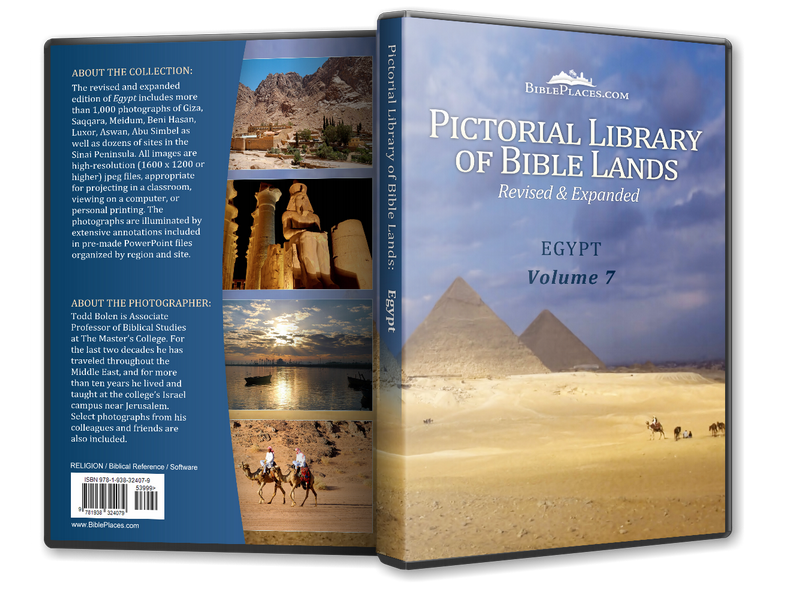 The most spectacular aspect of this temple is its setting in the solid rock above the banks of the Nile River between the First and Second Cataracts. As impressive as Abu Simbel is, it probably would not be quite as famous were it not for its relocation because of the construction of the Aswan High Dam. Between January 1966 and September 1968, the restoration work crews carved the temples into over a thousand pieces. Some of the blocks weighed as much as 30 tons a piece. They were removed and raised over 200 feet. The pieces were then reassembled on an artificial hill above the reach of Lake Nasser. 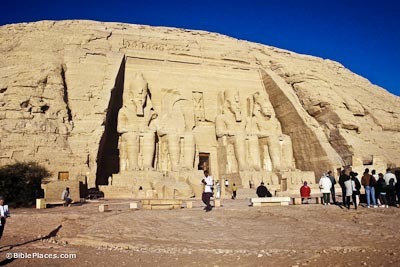 Ramses II built the Great Temple to honor himself and the gods of the state. 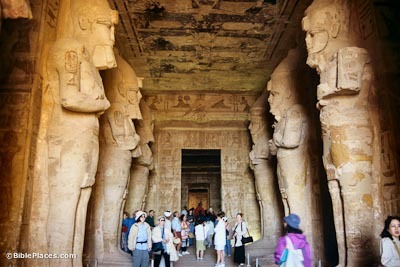 The four seated statues of Ramses are about 20 meters in height. At the feet of Ramses stand the statues of his favorite children. Many stelae were found at the southern end of the temple, including the famous Marriage Stela. This stela describes the arrival of the Hittite princess to Egypt to marry Ramses following the treaty with the Hittites. Inside the temple, eight Osiride statues of Rameses II are attached to pillars and support the roof. 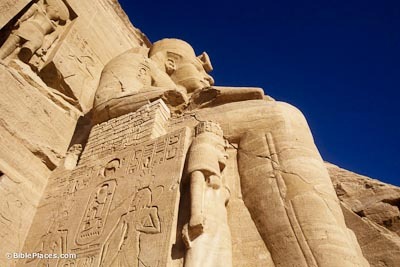 The sun shines on Ramses II’s statues only two days out of each year: Oct 22 and Feb 22. These two days were his birthday and his coronation day. Today there are big celebrations at the temple on these two days. 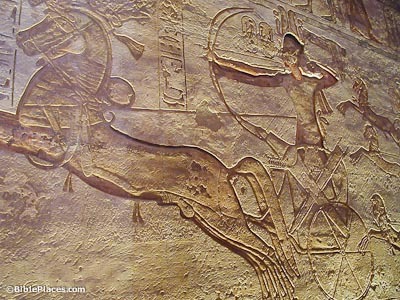 The walls depict scenes which show Ramses’ greatness in battle. Ramses was particularly proud of his victory at the battle of Kadesh and depicted this on numerous monuments including this temple. Scholars today believe this battle with the Hittites was a stalemate. 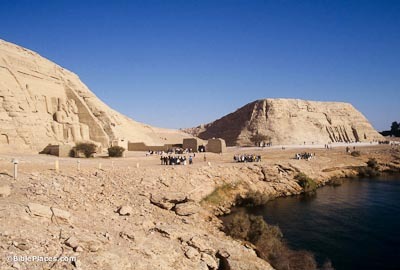 The Temple of Hathor is to the north of the Great Temple. It depicts Ramses II’s first queen Nefertari on the facade between statues of her husband. The inside of this temple shows Nefertari participating in the divine ritual in the same capacity as her husband. The holy of holies features a statue of the goddess Hathor represented as a cow.